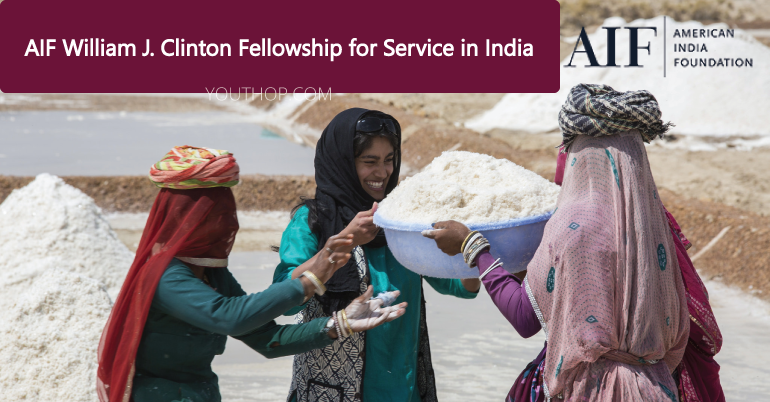 Applications are open for the AIF William J. Clinton Fellowship for Service in India 2019-20. Fellows support AIF’s partner organizations at a crucial moment of scalability by meeting their human resource and organizational needs. Together AIF, Fellows and host organizations form dynamic cross-cultural partnerships to exchange knowledge and skills, build capacity, and foster learning to fulfill our joint commitment to improve the lives of India’s most marginalized communities. Since 2001, the AIF Clinton Fellowship has been a strong model of SDG-17: Partnerships for the Goals. As we collectively strive for a more equitable society in our globalizing world, the importance of strong and respectful cross-cultural collaboration grows every day. Each Fellow is paired with a mentor at the host organization and with a mentor at AIF for support throughout the project. During the selection process, we take note of the skill sets and career aspirations of potential Fellows to match them with appropriate AIF partner organizations. The Fellowship creates a community of socially engaged, global citizens dedicated to positive change. Fellowship Alumni have traditionally applied their leadership in the areas of international development, education, social entrepreneurship, technology, business, academia, journalism, public health, human rights, and others. Together they represent a collective force for sustaining a long-term agenda dedicated towards change in India, the United States, and beyond. The AIF Clinton Fellowship provides a renowned platform to develop the skills, resources, and network needed to become an effective and socially-minded change maker. • Have completed a Bachelor’s or undergraduate degree before the start of the program on September 1, 2019.While the program is highly competitive, development work is by nature interdisciplinary and requires teams with diverse skill sets. We strongly encourage interested candidates from all fields, disciplines and sectors to apply. We welcome applicants from a variety of backgrounds and levels of experience, both professionally and personally. Whatever their field may be, all candidates should demonstrate a deep interest, passion, and commitment to social and economic development in India. Candidates must show humility and an eagerness to learn within a cross-cultural context. Ideal candidates possess strong professional skills, relevant volunteer or other practical experience, and applicable academic credentials or training. They show a potential for leadership and are entrepreneurial, innovative, and creative in finding solutions and navigating unknown environments. Candidates must be flexible and adaptable, and possess exceptional ability to build meaningful relationships across cultures in the social development space. A sensitivity and ability to work with vulnerable communities, as well as humility and passion to acquire new skills informally and “learn by doing” while on the project, are essential. Apply on the link provided.